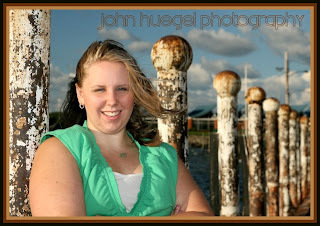 During senior sessions we will occasionally stop by the bayfront for some photos. There are some iconic shots available with the water and the tower in the background, and there is this string of rusty posts heading off toward Run Runner’s that creates a great leading line and pattern. In this shot, Kaylee is posed near the closest post. The sun is to camera left and so is the wind. This resulted in a casual, outdoor look. A moderately open f-stop threw the background posts out of focus. An interesting sky with “Simpsons Clouds” tops the image.